KALAMAZOO, Mich. (NEWSCHANNEL 3) - Kalamazoo's peregrine falcons are expanding their family. The birds have a nesting box on the side of the Fifth Third Bank in downtown Kalamazoo. 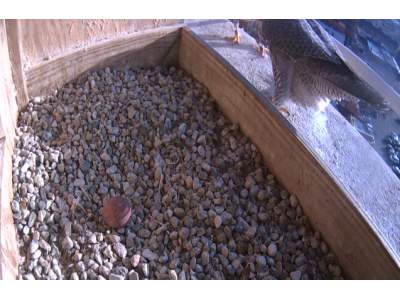 The latest images from the nest cam show a single egg in the nesting box. The first batch of baby chicks came to Kalamazoo in 2014. Four chicks were hatched in that very box thanks to some volunteers who installed it outside the bank's 13th floor. Last year another four babies were born. If you'd like to check on the progress of this latest bundle of peregrine joy, click here: http://www.kalamazoofalcons.com/nest-cam.